The unofficial start to summer is now here! Yeah I can hardly believe it. We have had such a slow go at getting started this season with all the rain and cold weather. I think though that now we should have the nicer weather and quite possibly it seems like it is here to stay. With all the nice weather that we have upon us it also is bringing out the best in the spring blooming perennials. Clematis ‘Vino‘ is one of the first Clematis vines to blooming my garden. This shorter sized variety is perfect for a small obelisk or mailbox garden. ‘Vino‘ blooms a magenta/ purple color in my part shade location. Keep in mind that Clematis can bloom differently from state to state and location to location. The bloom color on clematis can be varied by the sun/shade location, the amount of humidity that is in your area along with the time of year that it is blooming. Clematis may bloom one color in the spring and then rebloom a slightly different shade in the late summer. 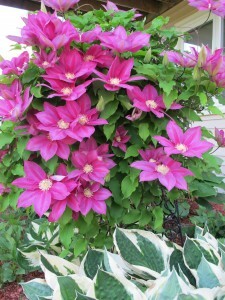 Clematis are a wonderful choice for an added interest in vertical gardening. (Geranium) Americana® White Splash Geranium is a top seller in the Americana® series. 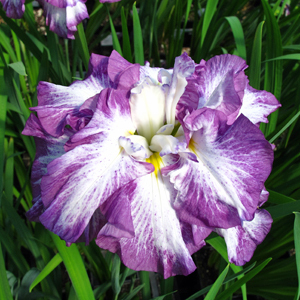 The Americana® Series, is known for its clean and intense flower colors and for the large flower heads it displays. 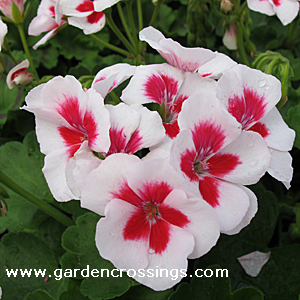 The eye catching, clean white with pink blotch flowers are great performers in the landscape or in a planter . The colors of spring, besides Lupine, Columbines has go to be my second favorite spring blooming flower. It does not matter which Aquilegia variety it is they are all a wonderful addition to spring. 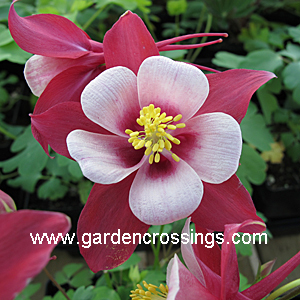 Aquilegia ‘Origami Red & White’ is a wonderful bloomer with color lasting up to 12 weeks. When the plant is done blooming you can let the seed pods dry up and then sprinkle seeds all around. I will warm you have go to love Columbine if you choose to doe this because you will have them everywhere. So pick a great location and spread the seeds in love. ‘Origami Red & White’ is a great plant choice when looking to bring in natures added attractions of butterflies and hummingbirds. But don’t worry the unwanted guests of deer and rabbit will usually leave this plant alone. (Coral Bells) Heuchera ‘Miracle‘ is a hot new variety that truly is a miracle in Heuchera breeding! The plant goes through several changes in leaf coloration throughout the seasons. In the spring, the young foliage is chartreuse with a heavy smattering of reddish purple in the center. As the foliage matures, it turns brick red with a bright chartreuse to gold edge and silvered undersides. Try planting near a walkway or in a container where passerby’s can enjoy its beauty up close. Heuchera ‘Miracle‘ is a very good grower that is tolerant of high heat and humidity!